I'm sure a lot of you have heard of the brand Kosé. If you haven't, it's a Japanese brand famous for its whitening and brightening essence - the Sekkisei lotion. I was lucky enough to be able to trial the lotion recently, and am now sharing my review of it, along with pictures and tips on how you can transform this essence into a hydrating mask. 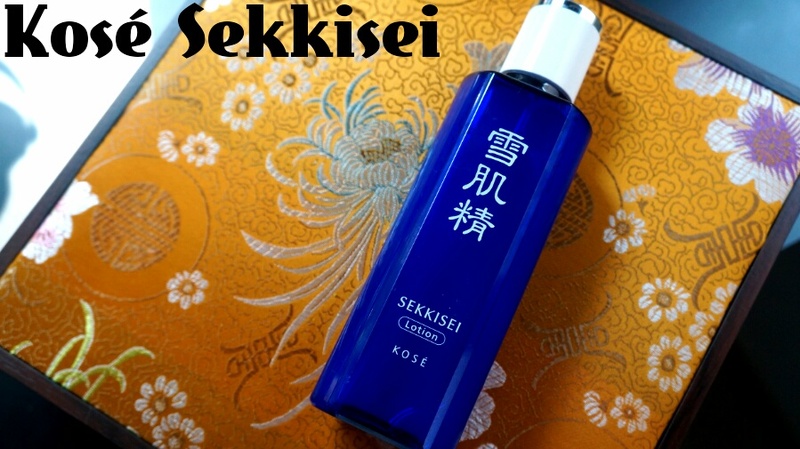 The Kosé Sekkisei Lotion is a lightweight, cooling liquid that comes in a medicinal-looking blue bottle with a white cap. It smells refreshing and slightly floral, with a tinge of that astringent smell that can sometimes sting your nose if you get too close. The blue bottle that houses the lotion is sturdy, and made of a plastic material. It is heavy and well-made (as is the cap), and feels luxurious despite the fact that it isn't a glass bottle. It looks very authentic because the feature of the bottle is the large Chinese text printed down the centre of the bottle. The silver tip of the cap also makes the bottle look very luxe. My first use of this product was as a hydrating and brightening mask. I was given these mask sheets (they look like large tablets, and can be soaked in any essence to act as a mask. You can buy them at Kose counters) to use, and basically just poured the lotion out into the cap, where a line is marked to show you how much to pour. I then popped the mask sheet, sized perfectly for the cap, into the liquid, and waited for it to expand. Once it expanded, I simply opened up the mask all the way, and applied it to my face. It doesn't take too long for the mask to absorb into the skin - after about 10 minutes, the lotion had fully absorbed into my skin and the mask sheet was almost dry. I then applied whatever was left in the bottle cap onto my skin using my hands and a patting motion - and I was done! The results were immediately visible. My skin was a touch brighter, and it looked plump and radiant. The mask also helped me soften a couple of blackheads near my nose. If you want to experience the Kosé Sekkisei lotion for yourself, come to the Japan Beauty Week where Kosé will be exhibiting their products, as well as bringing in their resident international makeup guru Mr Dobashi, to share with you makeup trends ans application techniques. I will also be at the event, sharing my experience with Kosé and hopefully to meet some of you guys there. 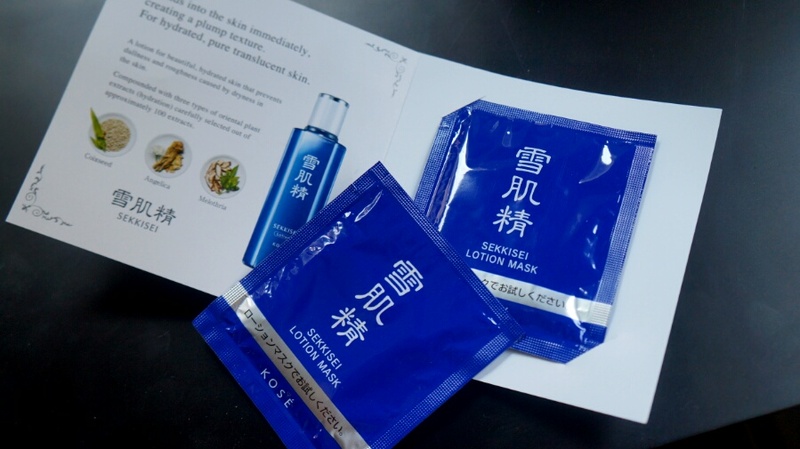 If you want to grab a goodie bag containing the famous Sekkisei Mask (pictured below), then make sure you come over and visit their stand at Japan Beauty Week! For more information about JBW, click here.